This is a subject that I know most people don't think about. Seems to come up a lot, however, when folks find that you were a submariner. That subject would be how we changed from the diesel/electric fleet boat of world war two (seen above) to the sleek killer of today. I know many of you know the basics but as one who lived through the two decades in the title (a portion actually in the Navy), I thought I might fill in some gaps. There are fewer of us hanging around who have ridden the "smoke boats" every year. If you are one who likes to learn about things that others take for granted - you may like this. The boat you see above is a fleet boat. It was the backbone of the sub force for probably 25 years. It was so named because by about 1931 (guesstimate by Wikipedia) our subs were able to travel with and range ahead of the fleet. I think they were capable of making 20 knots on the surface. They were to go to their area, submerge, and lurk. Their job was to create havoc before the battleships met. Anyway, that was the plan. Then came Pearl Harbor, most of the battleships were gone, and tactics had to be altered. If you look at the silhouette you could almost mistake this submarine for any number of surface ships. In fact, they were a surface ship that was capable of diving. They couldn’t stay underwater long because they ran out of battery and air. Looking at the density of crew in this picture I expect you can imagine. The term boat is vestigial from the days when submarines were small and transported on ships. The fleet boat came from five classes. The first ones made were the Tambor and Gar classes. The Gar was really a modified Tambor and some say not really a new class. Then starting construction in June 1942, the Gato class followed quickly by the Balao class. In the latter stages of the war came the Tench. They appear almost identical but each class had increasing performance standards. I tend to talk too much about submarines or old cars. In an attempt to control that I have given several links. You can follow these links to videos that give either information or entertainment. Some may be clickable but others may need to be copied to your browser. This model (USS Corporal SS346) shows a ship that is a little more streamlined. It got a nose job to reduce the amount of drag underwater. The battery capacity was increased to improve underwater cruising range and speed. Guppy stands for Greater Underwater Power Propulsion with a y added because, after all, we are submariners and a guppy is a fish. This is a Guppy three which is as advanced as any WW2 era boats became. A guppy three is 15' longer than the other guppies and they all had the three "horns" on the deck. The guppy twos did not have those horns. One improvement to the guppys over the fleet boats was the sail. Some older designs were not high at all (see the fleet boat). This new sail (called the north Atlantic sail at least in Groton) put the lookouts in less danger of washing overboard. Probably the biggest and most important modification was the addition of the snorkel. That was a tube, developed and used by the Germans in WW2 that allowed you to run an engine underwater. I’ll go into some details in a future article but for submariners it meant charging batteries and more importantly for me at least it meant fresh air. I was the ships Medical Department Representative (corpsman). When we had been submerged for a few hours the corpsman needed to check the CO2 levels in the air. When the crew could not keep their cigarettes lit we were about at the point where we needed to snorkel or start managing the air. Entertaining but not real informative is this youtube video which is a tour of the Clamagore (SS343). She is now setting at the pier at Patriots Point as a museum ship. There are too many sights if you don't know where you are. Since she was my first boat I'm including it anyway. It is virtually identical to the boat above. Some fleet boats had snorkels as well but the Guppy boat was the most common in our diesel submarine force during the 1960’s. Today's submarine. Well not really. In fact this submarine, the Thresher was lost in 1963 but you get the idea. They make their own air and can run for years without refueling. 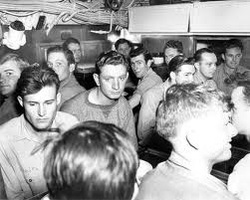 The Thresher class became the Permit class with her loss. The change wasn’t as simple as it might seem. Navy people are not like politicians. We have to go with what actually works and sometimes the acquisition of knowledge is start and stop. We didn’t go directly from fleet boat to the guppy, to the Nuke.. This boat is special and there were three of them. It’s the USS Barracuda SS550 but it’s also K1. It started life in 1949 and lasted until 1959. It was sold for scrap in 1974. Future president Jimmy Carter was on the crew. You might ask yourself what this was all about. Well these submarines were obviouslynot planned to be the far ranging, fast moving, killers of the second war. We were in a cold war now. Hostilities in Korea were about a year away and (I imagine) the thought was that we needed boats that could listen well. That was the trump card here. That massive nose was sonar. You can see the sail was streamlined although not larger than it had to be. Another boat, the Tigrone (SS419) resembled this. The K1 Keel was laid in 1949. From there the Navy shifted focus to hydrodynamics. The modern automobile manufacturer faces the same problem with finding more speed and economy. Our submarines were fast on the surface but slow underwater. Exactly the opposite of what a true submersible should be. Numbers sometimes lie. The 569 boat was started before the 555 boat. The Albacore was AGSS 569. We will look at the Dolphin (555) after the Albacore. AGSS designated a boat for special use. The Nautilus (our first nuke - 571) and the Albacore were being made at roughly the same time. The Nautilus looked much like a Guppy but had a brand new Nuclear power plant. The Albacore was built for speed but equipped with diesel electric power. I don’t know exactly how this went down but their capabilities were certainly compared. The Albacore made the Nautilus look like they had dropped anchor and this could continue for probably about 30 minutes. Then they had to stop and recharge the batteries. I know that the Albacore went through several configurations. I know she had two screws on what looks like one shaft but isn't. It's pretty involved and I could get really confused and lie to you here, but I won’t. Go to http://www.curbsideclassic.com/dockside-classic/dockside-classic-acceleration-from-zero-to/. One of the commenters tells about his father who was involved in this research at the David Taylor Basin. Also, Wikipedia does a pretty good job on the subject of the Albacore. The Dolphin. Sometimes known as the triple nickel. The last diesel electric sub on the active role. Keel laid in 62 and I enlisted in 61. Should I know about it. Yes, but I don’t. The reason for that is simple. It was pretty low profile. Deep diving, yes. Secretive about the electronic gear you could attach, also yes. For the record the biggest design difference about the 555 was the perfectly cylindrical pressure hull. At each end there was a hemispherical cap. This thing was made to withstand extreme pressure. There was an absence of compartments and instead there were interior frames to withstand pressure. How much pressure. I dunno. A lot. My knowledge comes from wikipedia, not memory. To help withstand pressure there was only one hatch. If the engine was to be run that hatch had to be open. It did not have a pressure chamber for escape, but a whole section of the keel could be explosively detached to make the rest of the boat shoot to the surface. USS Dolphin, courtesy of google images. Oh, did I mention that it was small. This gives perspective. The number seems somehow senior to the Albacore but it was built ten years later. Numbers lie. There are whole blocks of numbers that were cancelled. Other blocks barely saw service at the end of the war and were sold or given away to other countries. This submarine doesn’t look much different from the outside but it sure is. This is the Nautilus and she was the first submarine (or any class U.S. ship) to get underway on nuclear power. She used the same basic body lines as the guppy but even that actually was altered if you could see the whole boat. No need to load up with batteries, rock crushing diesel engines, or fuel. Obviously the reactor was not small but talking to the sailors that were on her I do not think they generally had to sleep with cases of soup when they got underway. There was also enough power to operate the stills. That meant the showers could be open a lot more often than once every ten days. If you link to this Nautilus video you will see several more. This might be the most publicized sub in history. So were we suddenly going to be exclusively a nuclear navy with all our new submarines? Not really. The Nautilus was, SSN571. I was on SS572. This is 572. It should be a nuke. Right? No, this is the Sailfish. She was commissioned as SSR572 and her sister ship was the Salmon 573. An SSR is a radar picket submarine. I am told the gear behind the sail was a raster radar. That means it moved up and down and was dubbed the nodding idiot by the crew. The 572/573 boats were bigger than most. I was told that was to accommodate the extra mass of the radar units. What I do know is that she had electro-hydraulic control panels like the nukes. If you wanted to open or close a valve you threw a switch instead of pulling a handle. This is what she looked like when I rode her. She was involved in missions up and down the Tonkin Gulf that year (1970). She looks like any Guppy three but she isn't. In the story about subs for Curbside Classic I actually got my two boats confused. Google Images did first but I was embarrassed that I just followed along. The Seawolf SSN575.Not exactly like the Nautilus or the skate class that followed. Her claim to fame is being one of a kind. She had a sodium cooled reactor which apparently did not work out. Contamination is what I was told back then. All of the other Navy reactors that I am aware of were pressurized water. There is a story elsewhere on this blog that talks about the Seawolf. She was an excellent boat that I operated with but she was hardly a chapter in the history of subs. More like a paragraph. Her misfortune was to be built during the same timeframe as the Nautilus. Like many of them, the Seawolf worked and others got the ink. Now why would one interject a 282 number this far into the 500s. The Tunny was a WW2 submarine that was placed back into service for Korea and future operations. The reason she is here is that she was converted to fire Regulus missiles. The Regulus boats were the first nuclear armed deterrent patrols. The firing platform was obviously old but that was not the biggest drawback to the regulus missile. She had to surface to fire and guidance had to be provided by another ship or sub down-range. She was a link in the chain from the WW2 fleet boat to the killer platforms that hastened the end of the cold war. Tunny, Barbero, Growler, Grayback, and Halibut are the names of the submarines that performed this duty. The Growler and Grayback were on the road to becoming Guppy submarines when the Regulus program came into being. Their designation was changed and the missile barns were placed on their decks. These four diesel boats were the first missile deterrent patrols. Polaris submarines were "on line" before these were decommissioned. This model is of the USS Halibut SSGN587. She was started with plans of having diesel electric power. Somewhere along the line construction was stopped and restarted with the intent of making a Nuke. I am unaware of this happening before. She has the distinction of being the only boat built specifically to fire a regulus missile. She was also the first Nuke to fire a nuclear missile. 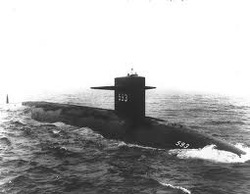 She was converted to a Nuclear Attack Submarine after the advent of the Polaris program and continued in some very important operations. She is another "one of a kind" boat. Speaking just as an observer, the skate class submarine was the class that put the designs proven by the Nautilus and Seawolf into production. She looks like a Guppy but obviously is not. This picture of her after punching through the ice show how different she is. The soft superstructure of my Guppy boats would never have broken through that ice. Nor would the power plant have allowed us to penetrate that far. The next video captures this moment. Now lets see if we can put the teardrop shaped (Albacore) hull into production using everything we have learned. These three boats were the last three operational diesel submarines used for what we have come to consider traditional submarine operations. On the same page as this link are other videos recounting the Triiton circumnavigating the globe underwater. Done since (I imagine) and repeatedly but she was the first. I was told that the main reason it was built was was to perfect techniques that were used to build the USS Enterprise. The Triton was huge. If you google images of the triton you can see it alongside other very large ships. I understand that it was longer than the Fleet Ballistic Missile subs that followed. Well here we are. We have taken the science we have developed to make safe operational nuclear reactors and the hydrodynamics of the teardrop (Albacore) hull and we have married them. This resulted in the skipjack class which reportedly could outrun the standard torpedo. It took us a lot of steps to get here. Some of those steps were backwards. The first nukes were very noisy. The Skipjack, not so much and submarines got even quieter in subsequent generations. I’m not sure if any were ever built that could outrun the skipjack class. Even the (Thresher) Permit class was a larger boat. That stuff is pretty much classified and I don't mind not knowing. So what did we forget. Oh yeah, the Regulus. Was that just an evolutionary dead end. In a way yes because it bears so little resemblance to what followed. The regulus boats were on line until after some Polaris boats were operational. The George Washington was started as the USS Scorpion (the name of a skipjack class boat lost in 1968). When the decision was made to create the Polaris (missile) boats she was redesignated and another ship under construction was given the Scorpion name. She was cut into two pieces and a 40 foot section was inserted. Because the 40 foot section was to be used on later boats as well, it was designed with a deeper test depth. In all 41 Fleet Ballistic Missile subs were built. They served as a deterrent force and were designed to stay at sea as close to continuously as human endurance would allow. This is where the Blue and Gold crews came into being. Upkeep for 30 days and go to sea for 60. Back to your home port when you returned and let the other crew take over. It was pretty choice duty as the fast attacks and diesels frequently spent about the same amount of time at sea. I spent four years on submarines during the sixties. There were still fleet snorkel boats around when I was there. I seem to recall about 80 diesels mixed with 80 nuclear attack boats with the 41 Fleet Ballistic Boats. Things were changing at a dizzying rate. I only know what I have read about the boats of today. I have no intention of writing about them. Much of this article comes from shipmates who had been around and didn't mind talking. Some were men who wore "war patrol" insignias.These shipmates are not available now and I am no longer 24 years old with a mind like a sponge. There are other stories I want to get to. How does a snorkel work? How did you see underwater? How big is the clutch on that engine? We will see what happens but I hope you enjoyed this. It was a long time ago but there is scarcely a day that goes by that I don't remember life on the boats. .